Our DC Regulated Power Supply are widely used in various industries and Educational Institutes. 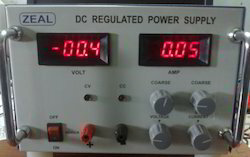 The output voltage produced by DC power supply ranges from 0 to 1000 V and output current ranges from 0 to 100 Amp. 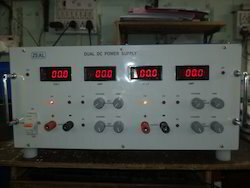 The power supply is provided with Digital Panel Meters for voltage and current. They are provided overload and short circuit protections. Our domain expertise has enabled us to come up with a comprehensive range of quality-assured Cell Boosters. 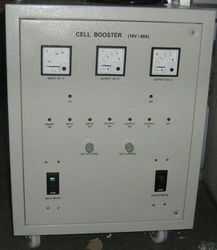 The offered range of Cell Boosters/Battery Charger is manufactured by our experienced professionals in compliance with the industry laid standards norms. Clients can avail these cell boosters from us in various models, configurations and other specifications as per their requirements. Below mentioned are the quality attributes of these cell boosters. Protection Suitable interlock so as to ensure that variac/control rectifier is at its minimum position while switching on the cell booster. 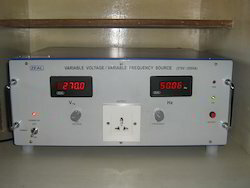 We are the manufacturer and the supplier of the Variable Voltage Variable Frequency Source. Metering :4 Digit AC Voltmeter &4 Digit Frequency Meter. Power ON/OF selection by toggle switch. Looking for Power Sources ?